Since the secret place of God is in Jesus who became the physical manifestation of the rock upon which Moses stood, the physical manifestation of God and His presence, we can only enter through Him. He Himself declared in John 14:6, “I am the way, the truth, and the life, No man comes to the Father except through Me.” It is by no special merits or achievements that we attain apart from Him, but is totally by His mercy and grace (Jude 2, and 2 John 3) which is showered on us as we truly repent of our sin as in Psalm 38:18, “For I will declare my iniquity; I will be in anguish over my sin.” As there was only one door into the ark in Genesis 6, there is only one door into the secret place of God’s presence, which is Jesus Christ. 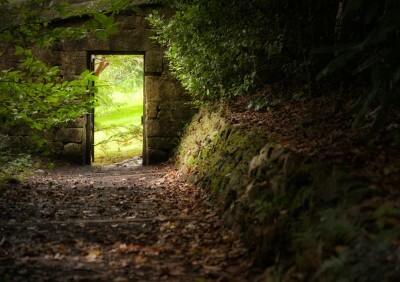 This door like the gate into a beautiful garden has been opened to us and as we enter we find paths of beauty and peace all around us, and now having been made family heirs we partake of its bountiful fruit and dwell in His secret place. It is a place that can’t be beat. It’s a hiding place when I’m afraid. In His secret place I’m dwelling there. He’s at my side to give me aid. The evil one cannot bring fright. In the nighttime I can sleep. He is there to cheer and bless. But His stronghold will never fall. He says, “Fear not” for I am nigh.